Scientists have found ‘birthmarks’ in two widely separated locations on the globe that are silicate material formed when our 4.5 billion-year-old planet was less than 50 million years old. University of Maryland Professor of Geology Richard Walker and fellow scientists in a multi-institution research team have found two ‘birthmarks’ within Earth’s mantle (the rocky middle layer between Earth’s metallic core and outer crust), consisting of silicate material formed when our planet was less than 50 million years old. 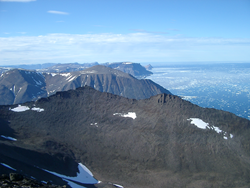 The team of researchers from the University of Quebec at Montreal, the University of Maryland, the Carnegie Institution for Science, the University of California–Davis, McGill University and the University of California–Santa Barbara found clear signatures of this distinctive material in two widely separated locations on the globe, Baffin Bay in the North Atlantic and Ontong Java Plateau in the western Pacific Ocean. Their work appears in the May 13 issue of the journal Science. Scientists believe Earth grew to its current size through the accretion of material from collisions with bodies of increasing size over several tens of millions of years early in the history of the Solar System. The last and most massive of these impacts was a collision between the proto-Earth and a planetoid approximately the size of Mars that resulted in the formation of our moon. Scientific consensus long had held it unlikely that any vestiges of rock from the earliest-period of Earth history survived. It was thought that the physical mixing and internal heat caused by the many collisions with other solar system bodies would have homogenized material from Earth’s early mantle. However, that view began to change with findings in 2012 by Walker and colleagues that indicated some material from the primitive mantle continued to exist until at least 2.8 billion years ago. According to Walker, the team’s identification of primitive mantle material was based on detection of an overabundance of an isotope of tungsten. The radioactive element hafnium, decays into the tungsten. 182-hafnium is a form or isotope of the element that was present when our Solar System formed, but is no longer present on Earth today. The decay of 182-hafnium into 182-tungsten is so rapid that variations in the abundance of 182-tungsten relative to other isotopes of tungsten can only be due to processes that occurred very early in the history of our Solar System. Corresponding author on the Science paper is Hanika Rizo is a professor of Earth and atmospheric sciences at the University of Quebec at Montreal. During the research for this paper, she held a joint appointment at the University of Maryland and the Carnegie Institution of Washington as a post-doctoral researcher. This research was supported by NSF grant EAR-1265169 (Cooperative Studies of the Earth’s Deep Interior program) to Professor Richard Walker of the University of Maryland and grant EAR-1250419 to Sujoy Mukhopadhyay of the University of California–Davis.